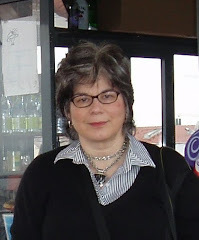 In a recent issue of the Temple Beth Abraham Omer newsletter, I gave a quick review of a Jewish cookbook I received. (Disclaimer -- a friend knows the author and I received the book for free.) I enjoyed the cookbook and most of the recipes so I thought I would adapt the article and include it on Blog Appetit. One note: I tested the recipe below during Passover and a period of intense weight watching so I had to make a lot of modifications. In hindsight, I probably should have picked a different recipe, but I do so love green chiles! And I needed a dairy recipe to mark the holiday of Shavout. 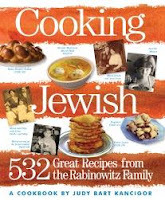 Called Cooking Jewish: 532 Great Recipes from the Rabinowitz Family by Judy Bart Kancigor (Workman Publishing), it is the record of an extended family through its recipes. The food varies from traditional Eastern European through contemporary American with selections also coming from other Jewish and international traditions. The book began as a small compilation of family recipes and grew as it was passed along and discovered by non-family members and the mainstream media. It still has a family feel to it, including photos of the contributing relatives and friends, family trees and more. As I read through the book, I kept feeling I knew the people whose recipes and stories are featured, perhaps because the timeline on the Rabinowitz family immigration and “Americanization” mirrored my own family’s experience. While the recipes are appealing, I suspect it is this sense of “this could be MY family cookbook” also attracts many readers. The food in this cookbook is not necessarily all traditionally Jewish, but it all is presented with a sense of connection and history and is offered with just a little schmaltz. In honor of Shavuot, I wanted to feature a dairy recipe. Below is my adaptation of one of Cooking Jewish’s recipes. This version is really more of an oven frittata. Kancigor’s version (see note below) is cheesier and a bit richer. Preheat the oven to 400 degrees. Spray a 9 x 13 inch glass dish with oil spray such as Pam. In the jar of a blender, combine the eggs, cottage cheese, salt, and Tabasco. Blend until smooth. In a large bowl, mix the shredded cheese, the chiles and the melted butter. Add the mixture from the blender and stir gently until combined. Pour into the prepared glass baking dish. Bake for 15 minutes, then lower the heat to 350 degrees and bake until golden brown and the eggs have set through about an additional 15-25 minutes. Serves about 8-10 as a main course (perfect for brunch or light lunch or supper), about double that as an appetizer. Note: To make the recipe as written by Kancigor, change to these amounts: 10 large eggs, 1 teaspoon salt, 10 drops of Tabasco sauce, 16 ounces of shredded cheese and 8 tablespoons of melted butter. Do not drain the chiles. Also, use 1 teaspoon baking powder and ½ cup flour. To prepare, follow the directions as above, but add flour and baking powder to the mixture in the blender and add the liquid along with the chiles to the shredded cheese mixture. Bake as directed, but allow more time (an additional 15-20 minutes) for the quiche to finish in the oven. It should be golden brown and puffy. Kancigor says this version makes 18 “brunch-size” and 36 appetizer portions. Want to read more about sharing family recipes and memories? Check out this post.